Easy Summer Memory Wall Decor! Once the 4th of July is over, we are in the thick of the Summer! You’ll wish that summer could always be here! Are you wondering why I am showing you a picture of a house taken in late fall? Well….I want you to notice the red trimmed storm windows on this house…which is the house Mr. S grew up in! We “rescued” one of the old stormwindows to hang in our house! 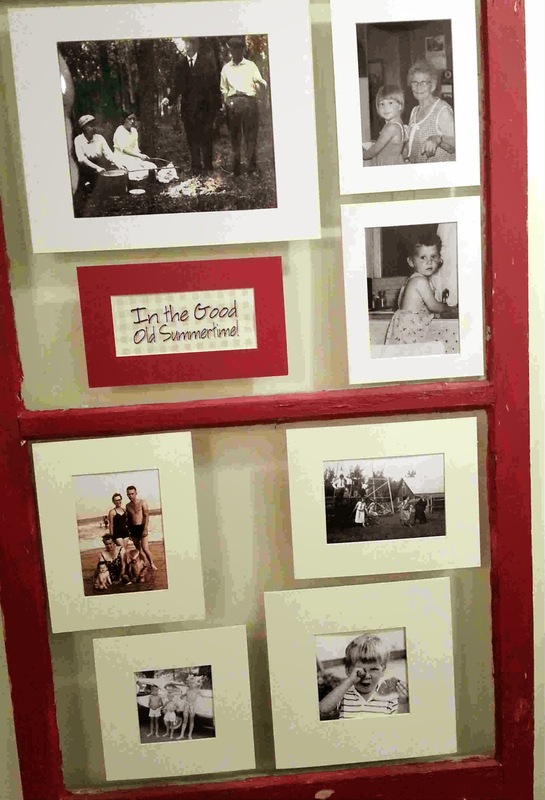 I decided to turn the window into a Summer Memory Gallery! I dug through some photos and came up with some of my favorite family images of Summertime! I used my trusty mat cutter to cut mats for them…..
but you could just stick the photos on the glass too! This photo is probably circa 1920….I don’t know about your family….but we really don’t wear suits for our campfires! This is the Sweetwater Daughter helping her Grandma do the dishes in the hot kitchen! That is little old me….at the sink at my Grandma’s House! The next image shows a group of people on the farm…”playing”…I think it is wonderful to imagine farmers who were working so hard….having time to play! The Sweetwater Son with a slice of watermelon….hamming it up for the camera! Mr. S and 2 of his brothers all decked out in their swimsuits…too cute! This is a photo of my family in 1952….swimming in the Atlantic ocean….it may be the only picture of my Grandmother in a swimsuit! It is fun to have these memories on the wall to enjoy! It is dark navy blue….and oh so little! 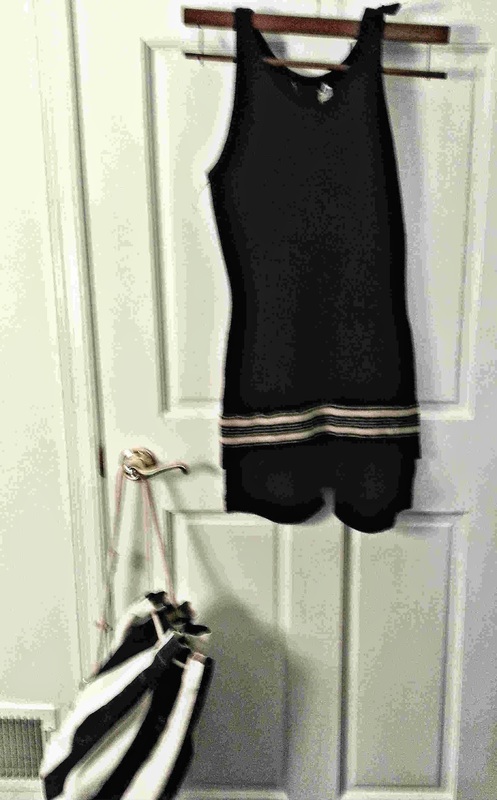 I had a navy and white beach bag that looks nice hanging along side! 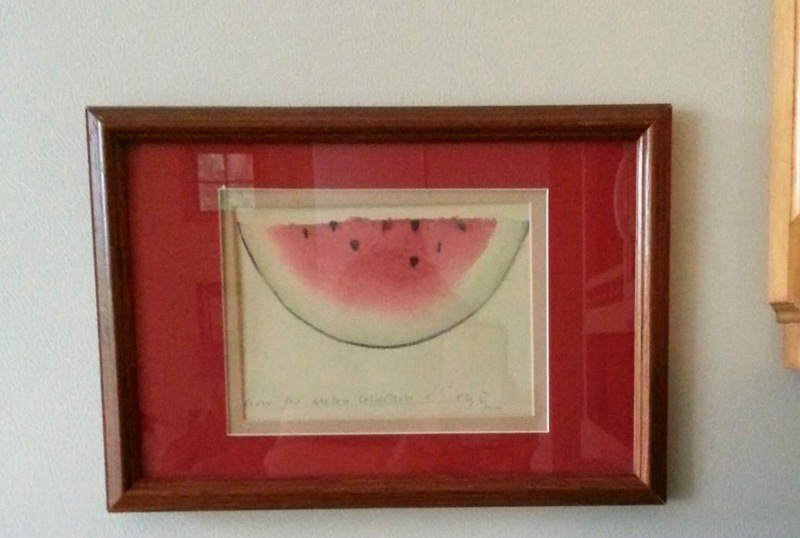 This watermelon print is hanging on the refrgerator! I used the trick of gluing magnets on the back of the frame! I was too lazy to take the chalkboard off the stairway wall…. That is why this picture is so terrible….sorry! 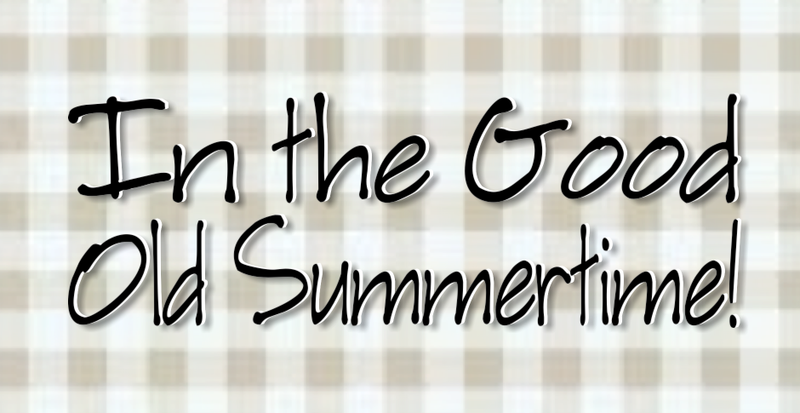 But…I saw this summertime message somewhere in blogland and thought it was really cute! 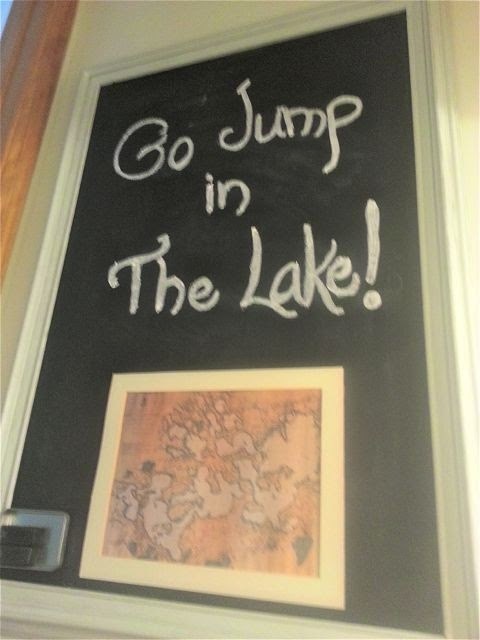 The lake map is actually a place mat from a lakeside restaurant we like! Posted in: art, decorating, framing, photography, simple pleasures, thrifty, use what you have. ← Hooray For The Red White and Blue!